It is time for holiday baking to commence! Russian Tea Cakes are something my mother baked for Christmas when I was a child. 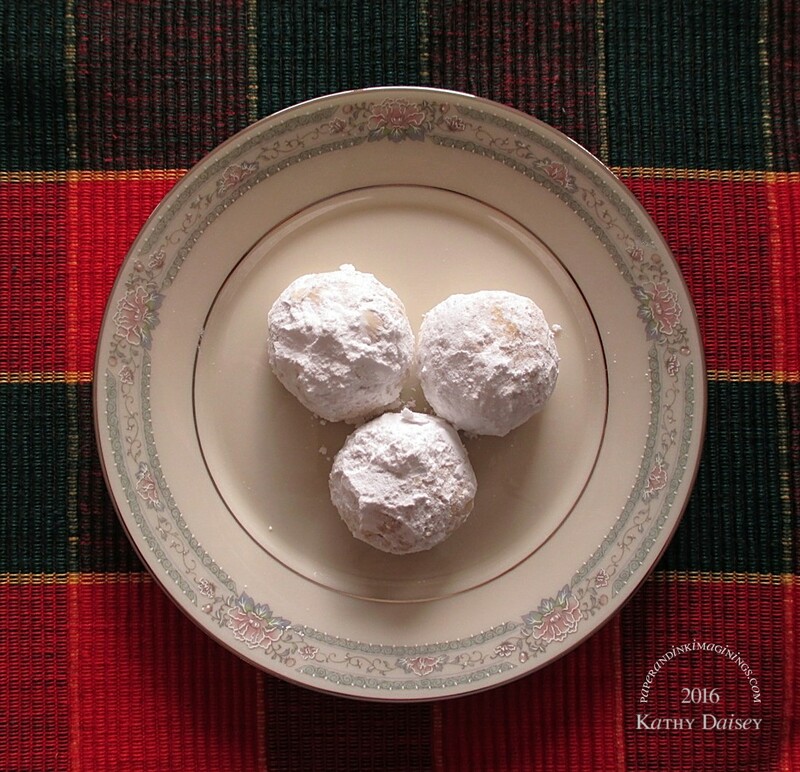 Her cookbook named them “Nut Butter Balls” (this was published during the Cold War…I am sure anything named “Russian” got a new name!). They are also called Mexican Wedding Cakes. I usually only make them for Christmas. It keeps them special. 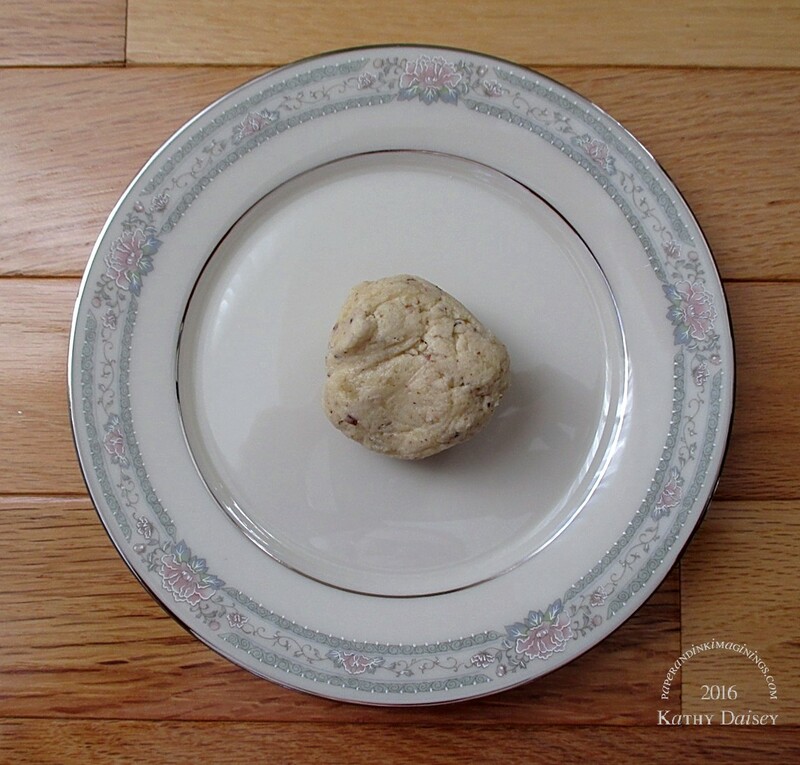 Roll dough into balls that are a little less than 1 inch in diameter (if you chilled the dough in a rectangle, you can now slice the rectangle into small cubes to be rolled – easy peasy). Bake at 350 degrees Fahrenheit for 12 – 15 minutes (bottoms should be golden, tops might be just starting to crack). Let cool on pan 5 minutes, then start rolling them individually in Confectioner’s sugar and placing them on wax paper to cool. Let cool on wax paper several hours. Note: You can substitute most any kind of nut. I have made them with pecans, I am sure I have had the same recipe shaped like crescents made with almonds. 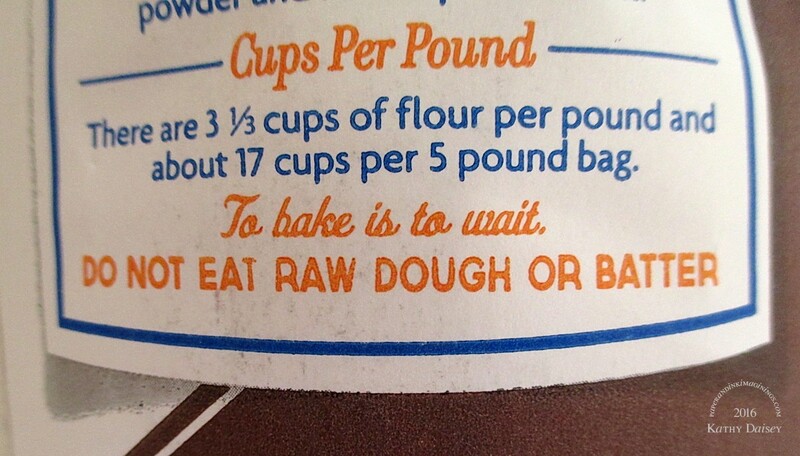 This dough has no egg in it, it was always considered safe to eat. Sorry, no lectures please…I am #TEAMCOOKIEDOUGH all the way. The dough is sometimes even better than the cookies! 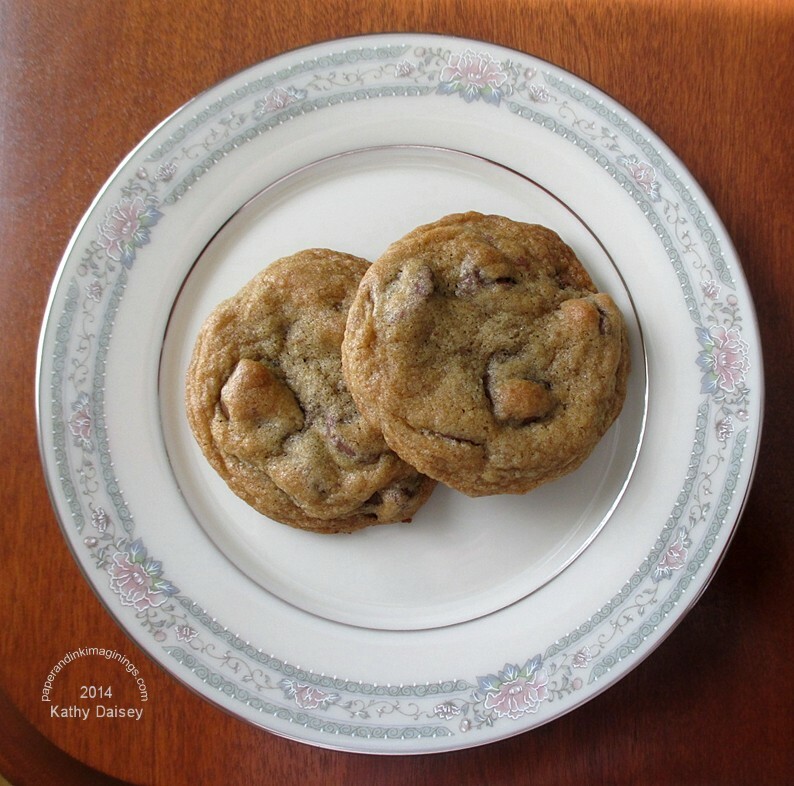 Categories: baking, sweet treats | Tags: recipe | Permalink. New Star Wars movie, celebrate you must! There is some Star Wars geekiness going on in this house. With “Star Wars: The Force Awakens” opening in theaters this week, I had to break out the Star Wars cookie cutters! Cream together butter/margarine & sugar. Mix in liquid ingredients, then work in the dry ingredients. Wrap well, chill overnight. 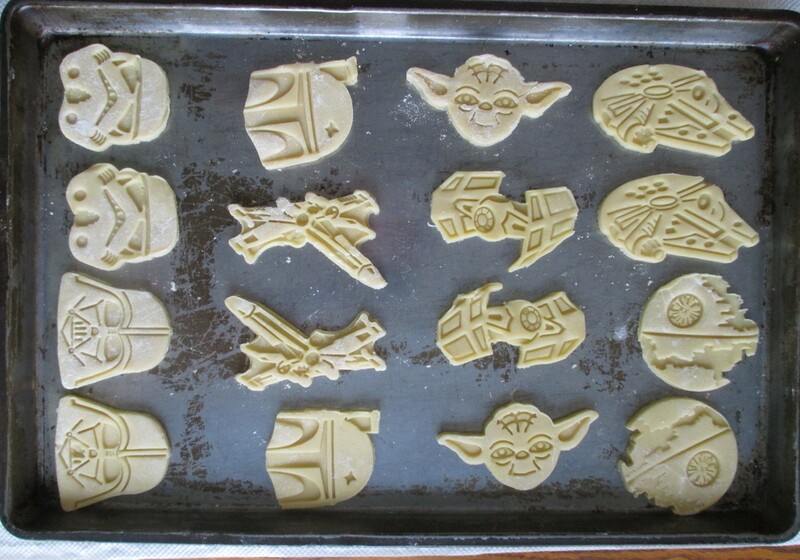 Roll out to desired thickness (the Star Wars cookies are much thicker than my usual sugar cookies, so the details would stay visible after baking). 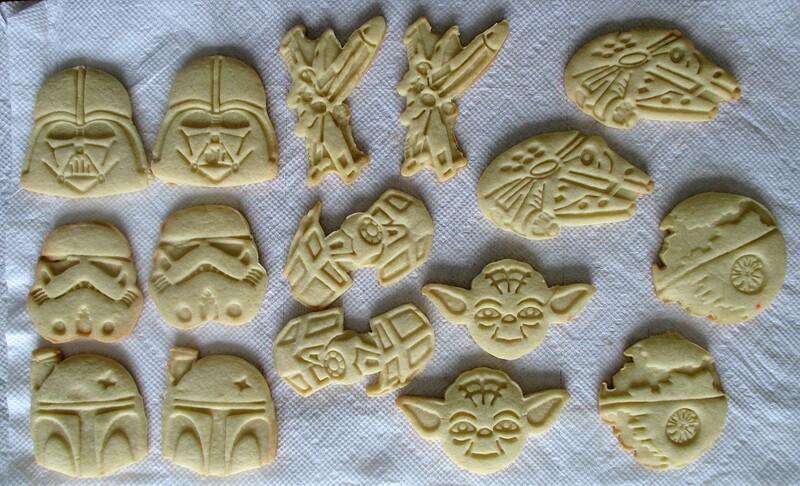 Cut with desired cookie cutters. Bake in 350 degree F oven for 8 minutes (longer if cookies are large and/or thick). My cookie cutters came in 2 separate sets – characters and vehicles, and were purchased at Williams-Sonoma in our local mall 5 or 6 years ago. I checked online, they currently sell a single set of 8 cookie cutters, but some are different from what I have. 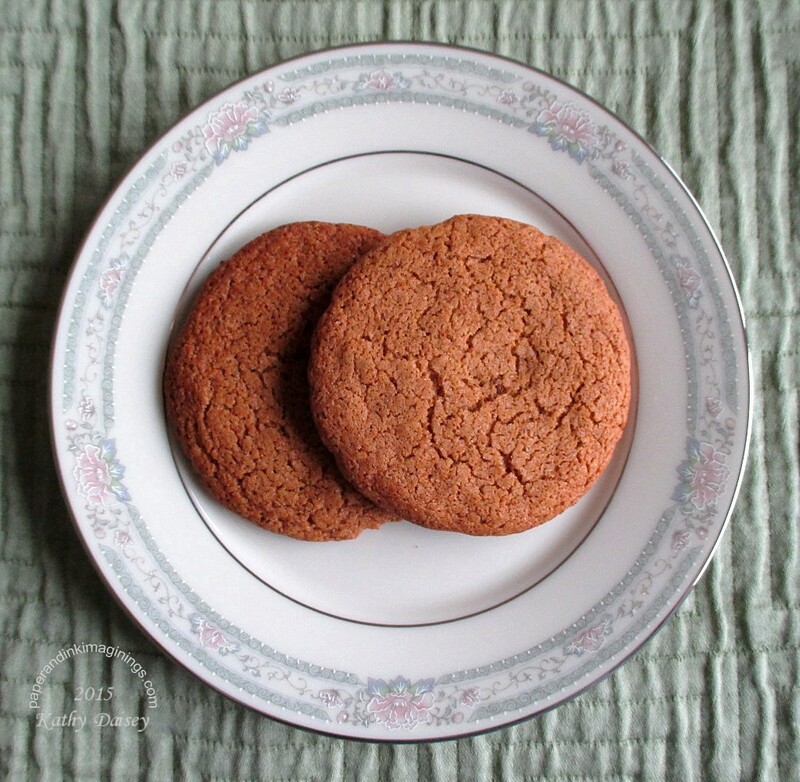 A few years ago while flipping channels, I stumbled upon Ree Drummond (“The Pioneer Woman”) making Monster Cookies. 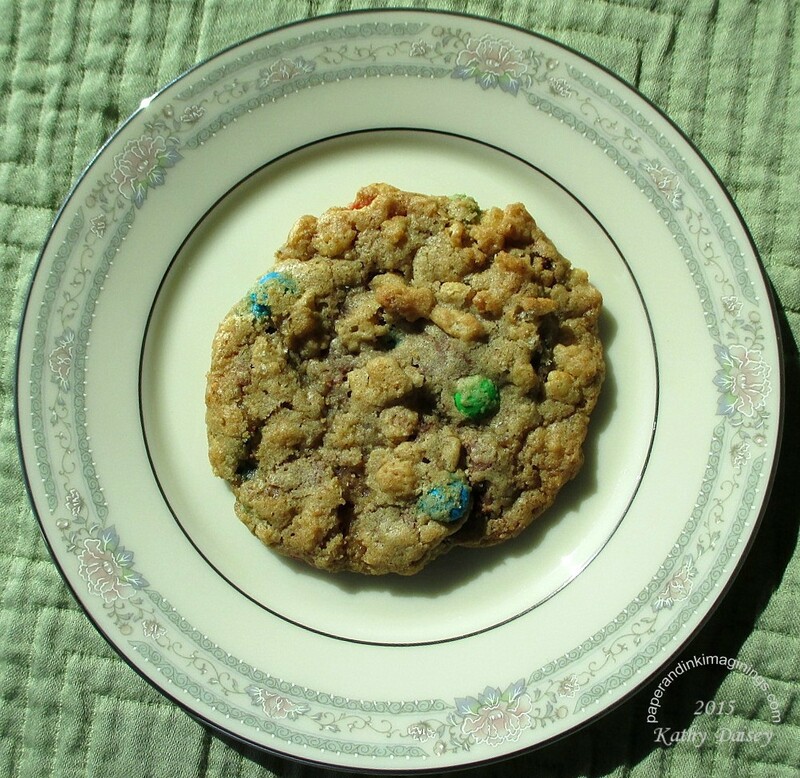 Here is her recipe – Monster Cookies by Ree Drummond . Hmmmm…too many suggested additions in her posted recipe for me. But I do like the cookie base. 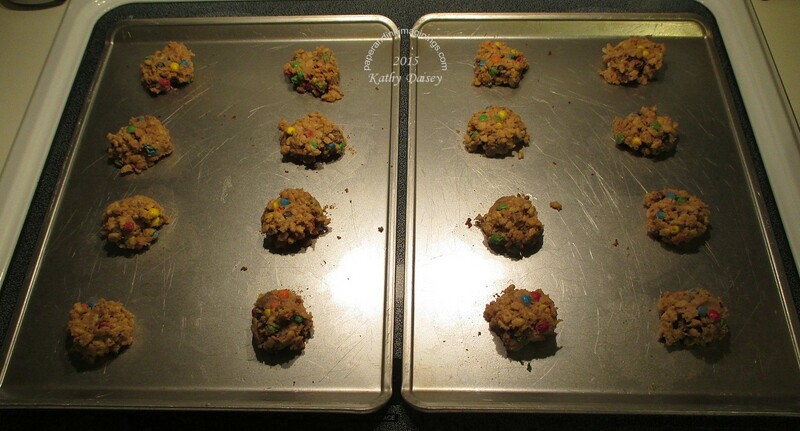 The first time I tried the recipe, I added regular M&Ms, pecans, oats, and Rice Krispies. But I skimped on the suggested amount of salt. This time, I dumped in (2) 8 ounce bags of Reese’s Minis (less what I ate as I worked! ), a 12 ounce bag of Mini M&Ms, and 2 or 3 cups of Rice Krispies. And all of the salt in the original recipe. The salt is just such a great counterpoint to the brown sugar and chocolate. Sorry for the photo quality…I baked at night, this is the best photo to be had in the kitchen in the middle of baking! I used my muffin scoop, and flattened each ball out a bit to help them cook evenly. 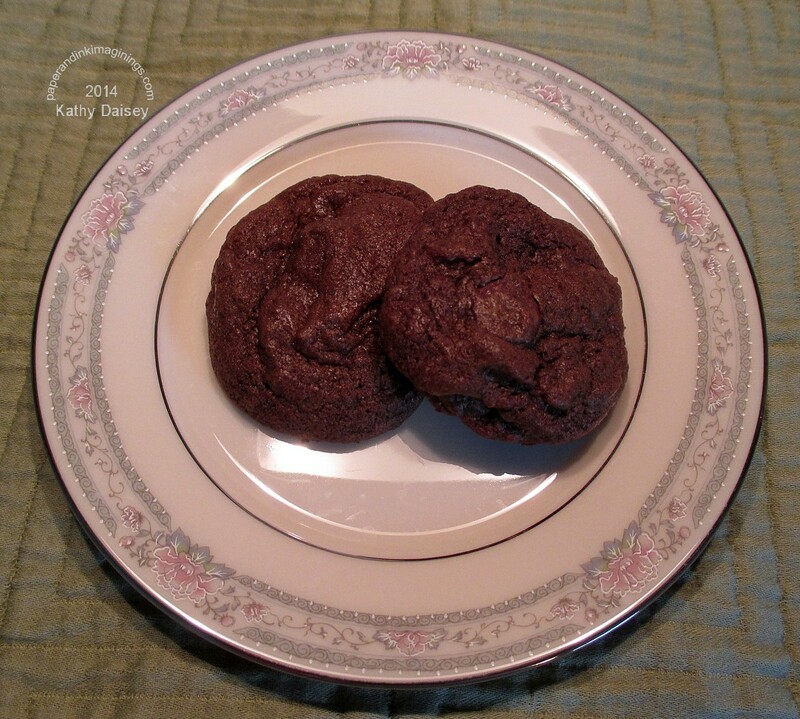 Categories: baking, sweet treats | Tags: chocolate, recipe | Permalink. I baked these a few weeks ago. We still have a few left in the freezer. Stir together first 6 (dry) ingredients (above the line), and set aside. Cream together butter/margarine and sugar until light and fluffy. Add egg, vanilla and molasses, mix until well blended. Mix in the dry ingredients (may need to turn off the mixer and switch to a wooden spoon – thick stuff!). 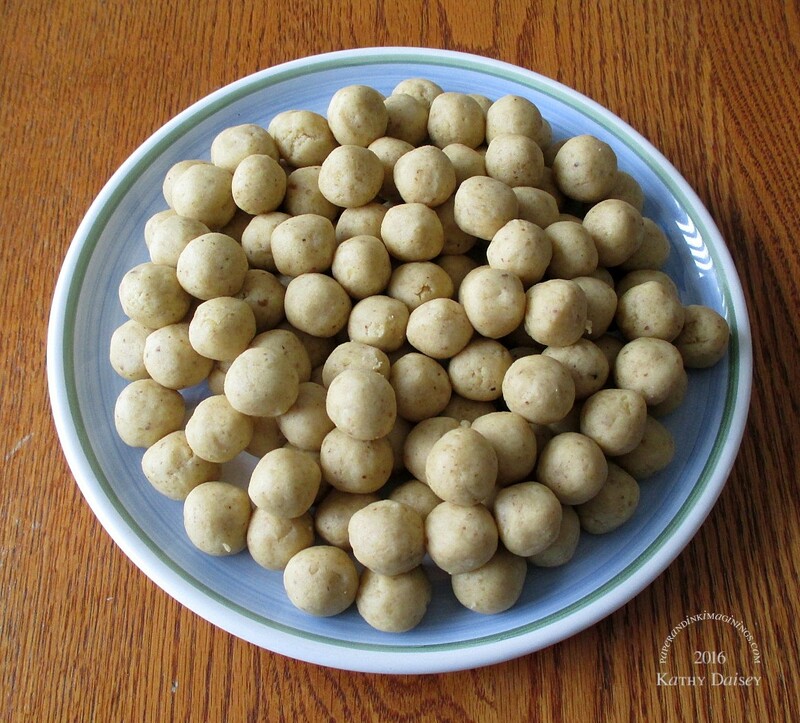 Roll dough into balls about one inch in size. Place on cookie sheet (well spaced, they will spread). Flatten each ball gently with flat-bottomed drinking glass (dipped in ice water). Bake in 400 degree F oven for 7 – 9 minutes (7 for chewy cookies, 9 for crisp cookies – at least in MY oven! Your mileage may vary.). Let cookies cool on baking sheet for a few minutes before removing to cool. This was my 8 hours of work yesterday. 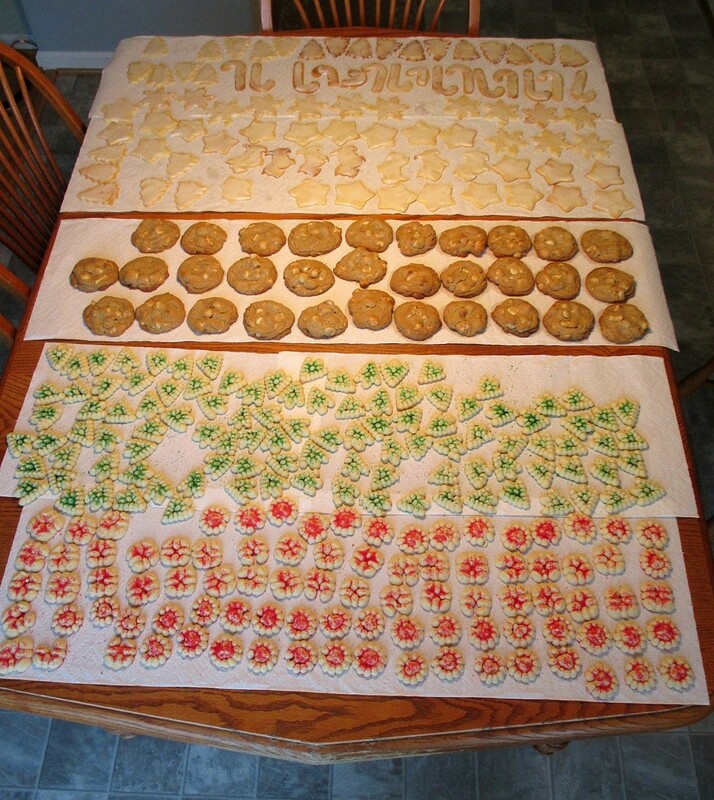 From the top: sugar cookies, white chocolate/macadamia cookies, butter cookies. I still have 3 more varieties to make, and a batch of cereal snack mix (our recipe is called Nuts & Bolts) to make. Categories: baking, sweet treats | Permalink. This week I tried the Dark Chocolate Mint variety. The inside texture was a bit like a York Peppermint Patty, and the mint flavor was better than the usual Nestle Mint/Dark Chocolate Morsel Winter mix. I used a bag and a half of DelightFulls to a regular batch of Nestle Tollhouse Cookie recipe, plus 1/3 cup of cocoa to make the batter chocolate. And, my oven runs a little warm, so I reduced the temperature to 350 degrees. The cookies were delivered within hours of baking to the college offspring. My parents stopped by last Friday, and my Mom always has coupons for me. 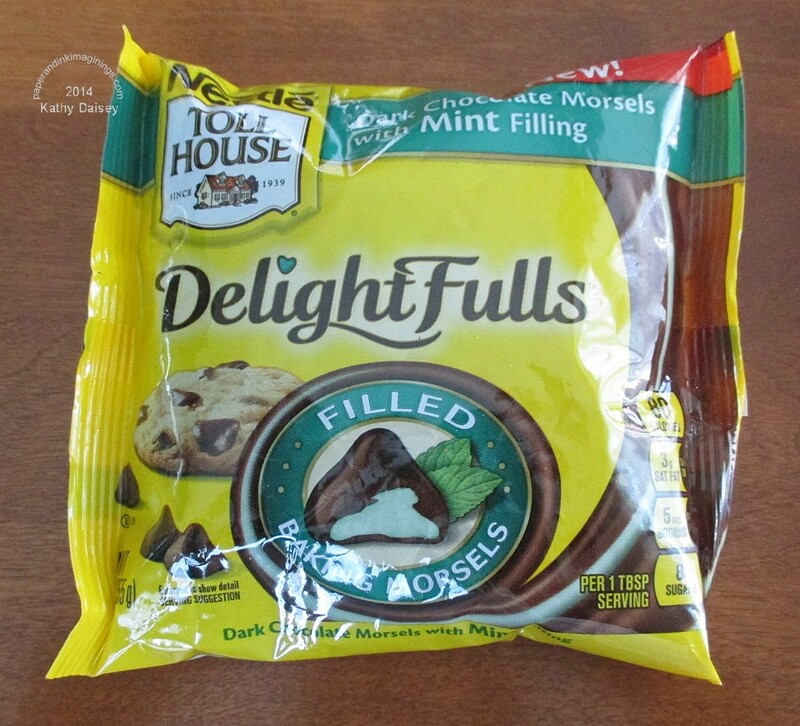 One was for a new Nestle Morsel product called DelightFulls….Nestle chocolate morsels FILLED with peanut butter, mint or caramel (I think?). Safeway had them on Sunday morning, and they were on sale – $3.49 instead of $3.99. Kind of expensive for a 9 ounce bag, but I also had the coupon for $1.00 off 2 bags. I bought the milk chocolate/peanut butter combo and the dark chocolate/mint combo. 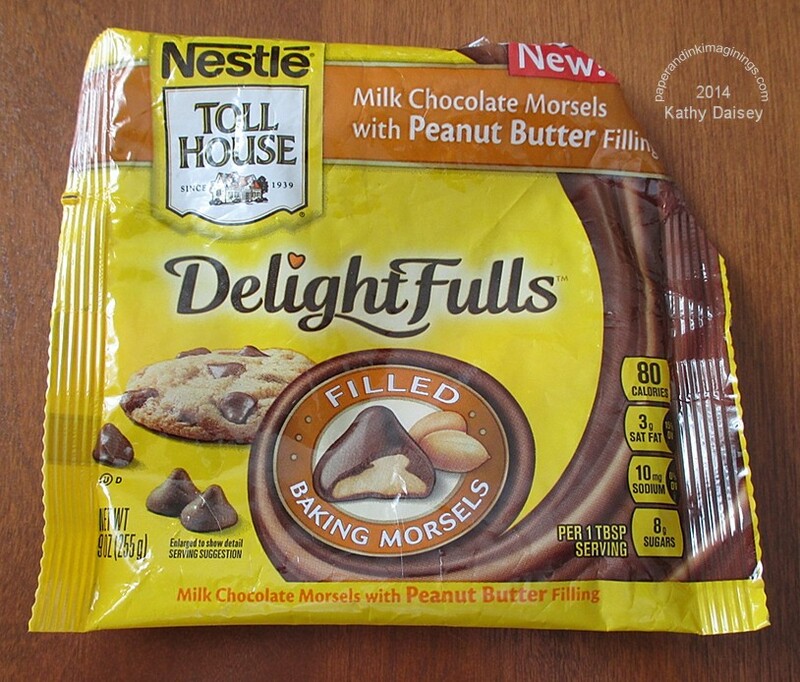 The recipe listed on the back of the milk chocolate/peanut butter bag is the standard Nestle Tollhouse Cookie recipe , using one 9 ounce bag of DelightFulls instead of one 12 ounce bag of semi-sweet morsels. Hmmm…methinks that is not enough morsel to dough ratio. So, I made a half batch of cookie dough and used the entire 9 ounce bag, and things turned out just fine. I am not impressed with the flavor of this milk chocolate/peanut butter variety…just a bit lackluster. I much rather put Reese’s Mini Peanut Butter Cups in the Tollhouse batter! Has anyone else tried this new variety of morsels yet? I would love to hear what you think! Categories: sweet treats | Tags: recipe | Permalink.